Stop. Is this working for me? How do I want to play? 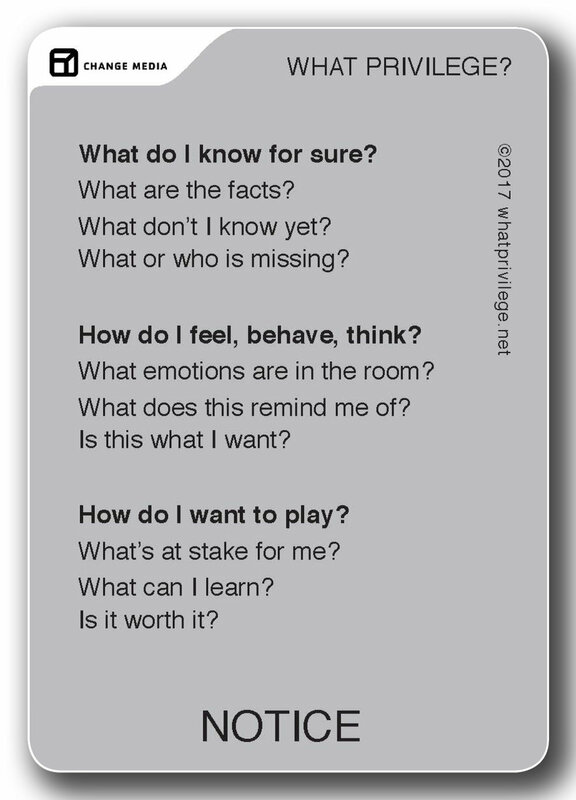 We have created a set of questions that we use to invite everyone to notice how they feel and think. When we enable ourselves to consider how and if we want to participate, we might be able to become present again. This is the first principle of change, to show up, to notice, to take responsibility and to figure out what is in our control and what is not. There's an elephant in the room - there's tension - how can we equitably discuss how to change it? We have created a set of questions that we use to challenge privileged assumptions and oppressive behaviours. We have found that if we invite everyone to consider the challenge with a set of questions, not statements, it not only shifts it from a 'problem', which encourages defensiveness, but allows everyone to share their perspective, revealing a multiplicity of values, beliefs and solutions. Disruptions to power and privilege are essential if we want to be able to negotiate equitably and create a new, fair and just power dynamic together. Now that we are talking about the elephant in the room - what change do we want? Every human exchange is a contested space, a negotiation, as each person brings their own set of beliefs and values, which inform their actions and desires. We can bully each other to get what we want, or patronize, believing our values are better, or collaborate and equitably negotiate mutually agreeable outcomes. We created these questions to unpack our values and desires, to imagine a world we want to live in, and to explore if other people have created these spaces. Reframing is the process of changing the story, its premise and future outlook, the key to a shared re-imagining of our finite time on this planet.